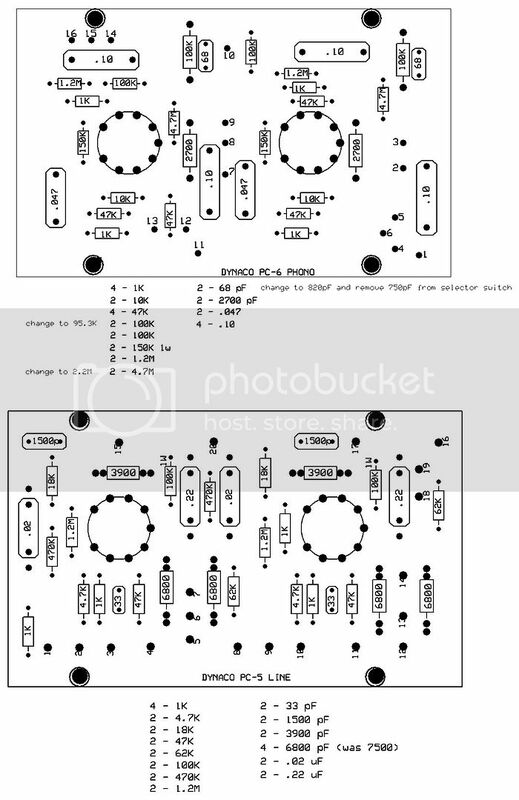 Roy Mottram of Tubes4HiFi was kind enough to let me post his board layouts for the PC-5 line stage and PC-6 phono board as found on the PAS-2 and PAS-3 preamps. Dynaco never listed the parts on these two boards in their assembly manual. When you got your PAS-2 or PAS-3 kit the boards were already preassembled. has a 1/2 watt resistor on it, it's 40 years old, doesn't even look like it ever got warm. that is .06 watts. The one resistor with the most power across it is the 100K plate resistor on PC-5 line amp. It has 130v across 100K for 1.3ma and that is .169 watts, about 1/3 of 1/2 watt rating. in reply to the last two posts, the .002 cap connected to eyelet 4 is part of the treble tone circuit. as for replacing the 7500pf with 6800pf in the bass section, two reasons I do this, one, try finding a 7500pf cap . . .
is a fairly minor change and might only give you 12db (that's 4X !!) of boost/cut instead of 15db. look at the info at the top of this page - all resistors are half watt except one is marked one watt. Most capacitors should be rated at 400vdc (you can always check the schematics to be sure of anything). then two much better re-drawings of the two PCB schematics. and then connect eyelet 4 and eyelt 11 together with a wire, as shown on the bottom schematic. Thanks, I find the original diagrams confusing, I didn't see where they labeled the voltage rating of the board capacitors, I've been trying to figure out what the voltage should be at the last stage of the filter to the boards. Does any one know what the current draw is for each board? I had it written down and I can't seem to find it. I was trying to figure out the power dissipation for the power filter resistors, I'm guessing that 2 watt resistors would be Ok but that's just a shot in the dark. see all my notes above, including a voltage chart from the PAS3 manual. None of the caps have over 200v on them. You can calculate the current for everything in the circuit using ohms law. The PC5 uses a total of 2.5ma. The PC6 uses a total of 3.1ma. After some listening, the PAS 2 seems to add a fair amount of bass and attenuate the highs, any way to fix that? sorry to say, but the 50+ year old design isn't the best. Easy solution, turn down the bass and turn up the treble. Best solution, sell it and buy a new preamp. I agree with Roy .. A lot of people want a vintage system with a Dynaco amp and Dynaco preamp BUT > The original Dynaco PAS-3 was only a mediocre preamp. Read what I said a couple of years ago on another post. Link below .. I thought about it for a while and decided to stick the tone controls back in. I followed the original instructions but, the controls don't really work the treble only makes a difference if you turn it all the way up, and the bass control functions like a volume control, you turn it up everything gets louder, you turn it all the way down and all but the very highest treble disappears and that even is reduced in volume. Is that close to what the original was like? or is something really out of whack? I have a question about competitors. A loooooong while ago I bought the phono and line amp boards for a PAS3 that I had gotten (for free ). The original boards were in a terrible condition, with just some components mounted (or maybe most were desoldered). As I have invested in a new camera (Canon EOS M) and saw agood way to fill the financial hole this purchase has created - fixing my PAS-3 and sell it. However when I start to inspect the boards I bought I cannot really see that they correspond to the board layouts (from Tubes4HiFi) and slowly, slowly I realize I bought the boards from Vintage Electron (eBay) and now I start to wonder if the layout is similar to "Dynaco standard" (or Tube4HiFi standard)? Hi -- A number of years ago (about , I also purchased from Vintage Electron (on eBay) a pair of his PC5 and PC6 fabricated boards. All I can say now is that the parts layout on the pair was similar to the original Dynaco 1965 boards and all the wiring was completed using the same numbered solder pads. While the layout my be slightly different, I believe his listing at the time stated that the circuits were the same as the original Dynaco's. Soundbrigade wrote: I have a question about competitors. link "http://dynacotubeaudio.forumotion.com/t215-board-layouts-for-the-pc-5-line-stage-and-pc-6-phono-board-on-the-pas-preamps-photos" that is on this site. If they are replicas they should be connected in an identical way. Yepp, I think the boards I bought are more or less (100%) compatible with the original Dynaco boards. As I wrote before, the Dynaco boards don't look nice, and I simply wanted to start anew. When fiddling with, especially, the preamps, I notice that there are loads of documentation - the various manuals issued by Dynaco, but when it comes specifically to the boards info is very scarce. Tubes4HiFi are one of few places that gives detailed info how to populate the boards , but as the boards, originally, came finished no info was considered to be necessary. So one of my concerns and questions was if the T4HF's boards were slightly identical to the Vintage Electron's and/or the original, meaning could I use documentation from any of these three as I wished. Thanks a lot for that info. At the moment I decided to grab new PCBs, you guys at Tubes4HiFi never showed up when I googled. strange, I just did a google for Dynaco PC5 and came up about ten listings from the top, even ahead of DynaKitParts.com !! Two -three years ago I got a different list from Google and made a descision accordingly. Anyway, it's good that there're good heavy PCBs made to match the original. I have fiddled some with my old Russian Priboi amp and there's not much copper left on those boards. Btw have you got component sets for the PAS3? i have not a pas but only the boards. where i can take the phono output on phono board? at what eyelet?